I'm replacing a light fixture in my house and am a bit confused about how the old fixture was wired. There are two pairs of wires, 2 black, 2 white and 2 ground. The two black wires were capped off together and not hooked up to the old fixture at all. The white and beige wire were connected two the old light I removed. I guessing one set of wires is power coming from the box and the other set is from the switch. The switch is a dimmer. The light I bought has black and white wires. Any ideas on how to tell which ones to hook them up too? Warning: You'll be working with live electrical wires during this procedure. If you don't feel comfortable doing so, please contact a local licensed Electrician. Set up your multimeter (or voltmeter) to measure volts AC. Very carefully remove the caps from the white wires, making sure the wires do not come into contact with anything. Touch one probe from the meter to the bare grounding conductors. Touch the other probe to the exposed end of one of the "white" wires. Touch the probe to the other "white" wire. You should have measured 0 volts to one "white" wire, and line voltage (~120 volts) to the other. Using a bit of black tape, or a black marker. Mark the "white" wire that measured line voltage to ground. Turn the breaker off, and verify power to the circuit is off. Connect the white fixture wire to the unmarked "white" wire from the ceiling. Connect the black fixture wire to the marked "white" wire from the ceiling. I partially agree with the answer from WarLoki. I'm concerned though. You mentioned that when you initially removed the old fixture that the black wires were wire- nutted together and the two white wires were connected to the fixture wires. This could also mean that the fixture is controlled through the Neutral line. As mentioned , get yourself a Voltage Tester or DVM (digital voltage meter) or you can wire a pigtail to a light bulb socket, so you can find which of the 4 wires is the common or hot. Check for voltage by opening and than closing the known toggle switch. If you find that a wall switch is controlling one of the white wires It is unsafe because the line will always be energized. I believe that may be the situation you have from the photo you posted and from your description. If this is the only fixture and there is only one single pole switch controlling that fixture and the power line starts at the light fixture this would indicate the wires are reversed. the white wires should be twisted together and the two blacks wires should be connected to each of the light fixture wires. I think you should double check this circuit and be positive that a single switch is controlling just this lone light. The fastest way to check is to use a volt meter and check between the white wire on the left and the (used to be) white wire on the right you should get 120v +- between the two. Now test between the white wire and the ground and see which one gives you 120v, that should be your switch leg, power to the fixture. With that out of the way, turn off the switch or breaker before wiring the fixture. I think the white wire that is to the right of the picture is the switch leg that goes the switch. That would need to be marked with black tape(that is the hot/power) and makes up to the back wire on the fixture. I think that the white wire on the left is a neutral wire and makes up to the white wire on the fixture. The green or bare wire in the fixture makes up to the bare wire in the back off the box. 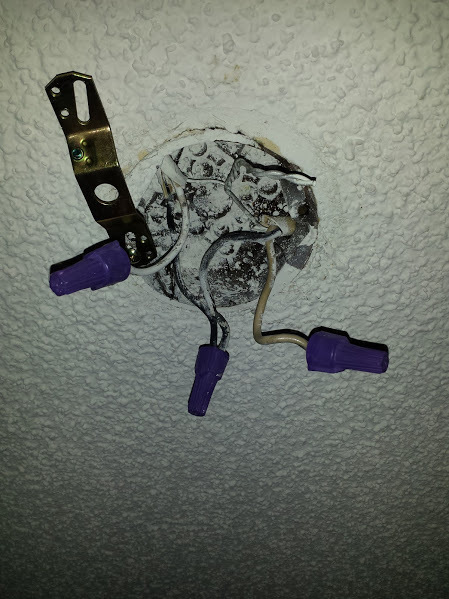 I see that you have aluminum wiring so make sure if the fixture has copper wires to use the correct wire nuts.